Sunday November 13 1910 It was a fine morning but I did not go to church I had some work to do I had left yesterday. Rob & Cora were out riding and stopped awhile. In the afternoon Rob & Cora came out for pumpkins. Emma Hart was here for supper and to spend the evening. Monday November 14 1910 Will had Charlie Hedges helping him make fence I was busy with the regular work and sewing some. Tuesday November 15 1910 Charlie came out today and rebuilt the chimney on the tenant house. I was busy with the work with the exception of an hour I went down town for things. 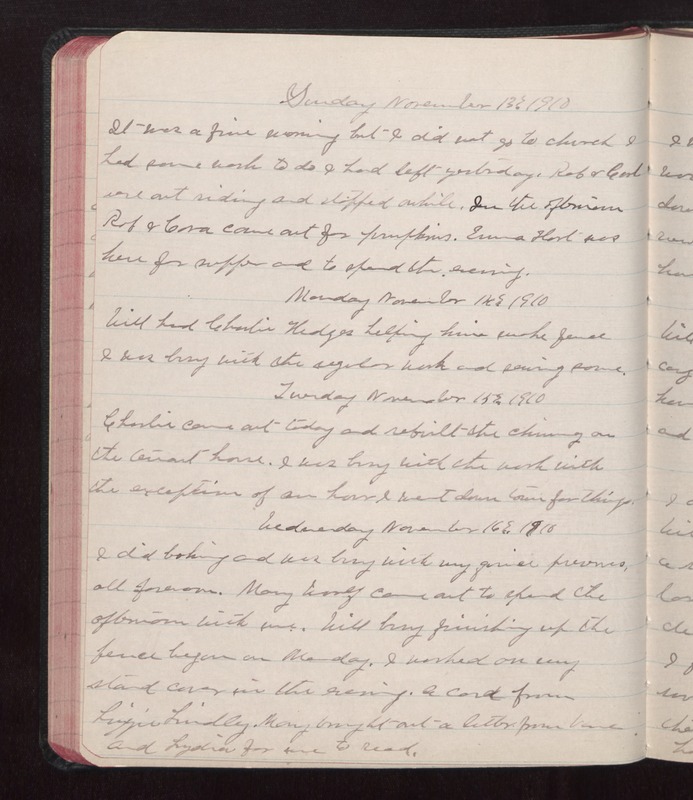 Wednesday November 16 1910 I did baking and was busy with my [quiet?] [illegible], all forenoon. Mary Woolf came out to spend the afternoon with me. Will busy finishing up the fence began on Monday. I worked on my stand cover in the evening. A card from Lizzie Lindley. Mary brought out a letter from [Vera?] and Lydia for me to read.